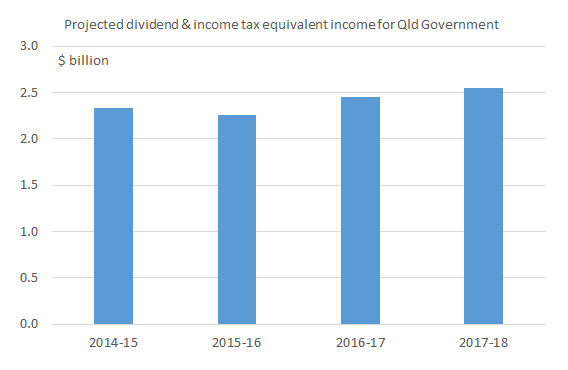 In addition to royalties revenue being lower than previously forecast, a major risk to the Queensland State Budget in coming years is lower than expected dividends from government-owned businesses. Currently government-owned businesses contribute over $2 billion to the Budget or 4-5 per cent of total revenue, and revenue of this broad magnitude is forecast by Treasury to continue over the forward estimates (see chart below). However, these forecasts may not eventuate due to the risk of unfavourable determinations from the Australian Energy Regulator (AER) regarding Energex and Ergon’s business plans for the next five years. The AER’s draft determination for NSW network businesses from late last year (see AFR coverage) suggests the AER might force Energex and Ergon to cut its proposed charges, and this could mean lower dividends (and income tax equivalent income) from the businesses to the Queensland Government. In a worst case scenario, this may result in a reduction in revenue to the Budget of several hundreds of millions of dollars per annum, compounding an already large fiscal challenge for the Government. The AER’s preliminary determination for Queensland network businesses is due this month, and I expect a number of George St econocrats are nervously awaiting its release. N.B. Income tax equivalent income is income paid to the State Government by government-owned businesses that would be equivalent to company tax income they would have to pay to the Commonwealth Government, if they were not Government-owned. This is done for reasons of competitive neutrality – i.e. to create a level playing field between private and government-owned businesses. This entry was posted in Budget and tagged aer, budget, dividends, electricityprices, energex, ergon, gocs, qld, queensland. Bookmark the permalink.